Matt is a part-time contractor with Intero. He started his freelance business in 2016 after leaving his position as an IT contractor with the federal government. Colleen found him through a link while browsing one of his client’s websites and it didn’t hurt that they were coincidentally neighbors. 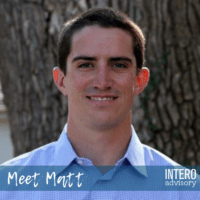 Soon after an initial conversation at the local Panera, Matt began helping to build in:side, Intero’s LinkedIn Mastery Program. Matt added his expertise in web development that the team needed to turn this online platform into reality. He spends a lot of time in code, making continuous iterations to in:side and the main Intero website. How would you explain your job to a child? I build websites. I use a combination of code and design to help businesses be seen on the internet. If you could redesign the food pyramid without any health restrictions, what would it look like? What are you known for? Hopefully, for being a talented, easy to work with, freelance web designer. Since starting my business I have worked really hard networking in the area and building a personal brand so when local business owners need a new website, they know who to call. What would your last meal be? Spicy Deluxe Chicken Sandwich with Waffle Fries and an Unsweet Tea and a 4 ct. Chicken Strips with extra Chic-fil-a sauce. If you won the lottery what would you do with your money? I would start a venture capital firm and invest in high-potential tech companies. I love following startups and reading about new ideas and technologies and would love to have a hand in it. I find it fascinating how quickly our society is innovating and look forward to how entrepreneurs we will leverage emerging technology. What’s one thing you wish people understood about your job? I don’t build Apps. When I tell people what I do they think that I also can code apps which proceeds to me having to listen to their questionable app idea. As we continue to highlight our team, we invite you to connect with us on LinkedIn and say hello. If you missed last week’s employee spotlight, we featured Liza Slavin. Please check out our new membership offering, in:side. There’s a plan for you, head over and learn more. Welcome, Sarah Bentley, to the Intero team! A recent graduate of Washington College, Sarah is a marketing master, a technology pro and a creative powerhouse. In fact, in addition to keeping things looking good at Intero, we can all look to Sarah for fashion and styling tips, as she has worked in and studied fashion with great interest over the years.